These are the best sales books for your 2019 reading list. Throughout my career, I’ve been a voracious reader, and I credit much of the success I’ve enjoyed so far to that habit. Of all the different types of books I read, sales books have probably been the most common (though I spend a lot of time reading books that have nothing to do with sales, which has tremendous value). When people learn of my “manic habit” of reading sales books, they often ask me which ones are the best sales books. More than any specific books, I’d recommend picking up the habit of reading to begin with. All of that said, I’ve read every one of the below sales books from cover to cover. Some of them, multiple times over. Here are my summaries, recommendations, and a few takeaways. Feel free to ask me questions about any of them in the comments. This is the sales book I’ve read the most (7x). The thesis is that the days of generic discovery calls and overly broad question-asking are over. Instead, The Challenger Sale recommends a new, provocative approach to selling: Commercial teaching. Rather than asking customers what keeps them up at night, The Challenger Sale recommends crafting an educational sales pitch that teaches the customer what should be keeping them up at night. This is a sequel to The Challenger Sale. It addresses how buyers buy internally within their organizations, and what implications that has to us as sellers. I’d actually argue that this book is more valuable than The Challenger Sale (but only if you’ve first read Challenger — you need that context). Why? The book discusses, at length, why most sales messaging is broken: It focuses on benefits, which are proven to have much less motivational power than using loss aversion (the idea that people will work twice as hard to prevent themselves from losing something than they will to gain something) to your advantage. As they say in The Challenger Customer, a product or service is something designed to get your from “Point A” (the status quo) to “Point B” (the end result or benefit). Most sales messaging is focused in explaining how wonderful “Point B,” when, the more effective approach is to focus your messaging on how dangerous staying at “Point A” is. 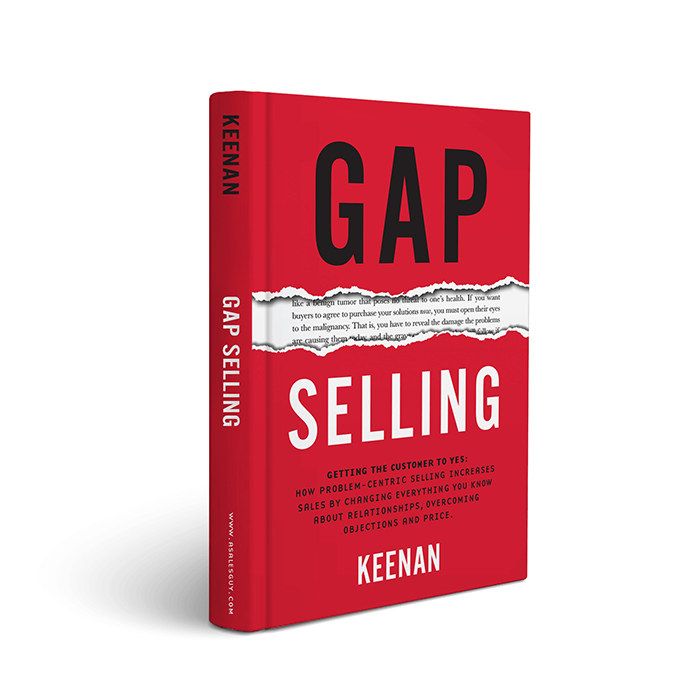 Gap Selling by Kennan has a mission of showing sellers how to sell more by helping their customers first. This sales book makes the case that at the heart of every deal, there’s a “gap.” It could be a gap between what your buyer has now, and what they want in the future. Or, a gap between who they are now, and who they want to become. Or more simply where they are now, and where they want to go. Closing this gap for your buyer is where value resides. Without it, you don’t have a deal. The world was missing a sales book dedicated to solving the problem of selling against the competition. Anthony Iannarino finally filled that niche with his new book Eat Their Lunch. If you sell in a highly competitive market, this one’s for you. Stephan Schiffman takes the legendary Stephen Covey template and applies it to the sales profession. Written by a legendary sales consultant with going-on four decades of selling experience, The 25 Habits of Highly Successful Salespeople is a must-read sales book – whether you’re a novice or seasoned veteran. The Gong.io data science team analyzed over one million B2B sales call recordings with AI to understand what the most successful salespeople in the world do, according to data. Most of the core insights we learned from our research can be found in 9 Elements of Highly Effective Sales Conversations. It’s chock full of data and insights on the most effective ways to hold effective sales conversations. Accelerate! podcast host Andy Paul has spent decades as one of the foremost experts on sales strategy, process, and training. Andy’s book Amp Up Your Sales is a deep dive that mixes cutting-edge research and field research to flesh out ways to get more first meetings, be more responsive to buyers, and efficiently reach and close your ideal customers. Robert Cialdini is a legend in human persuasion, originally publishing the timeless marketing and sales book Influence. More recently, he came out with Pre-Suasion, which discusses how you can prime people before the moment of persuasion to make them dramatically more likely to agree to your request. The research stories by themselves are gold. Selling software-as-a-service? Then you must read Blueprints for a SaaS Sales Organization. This book is particularly well-designed for sales leaders, managers, and even founder/CEOs — really anyone who owns the responsibility of building a sales organization. It’s definitely not a selling skills book. It’s more of a sales management book (and one of the best ones out there, in my opinion). It wasn’t until I graduated from my “tour of duty” in sales and moved on to run product marketing that I read this book. And boy, do I wish I read this one earlier in my career. It’s very similar to The Challenger Sale and The Challenger Customer in the sense that the focus is about teaching your customer about a problem (and using loss aversion to intensify the problem and create urgency). Conversations that Win the Complex Sale shows you the right kinds of stories to tell and how to cultivate the best possible message of value during your talks with potential buyers. I’ve gotten to know Peter Cohan the last couple of years, and he is the master of SaaS product demos. Great Demo! addresses a need that is underserved in all other sales books: How do you demonstrate your product in a persuasive way (in the right time and place, of course). He has great, memorable demo principles, such as “Do the last thing, first.” Highly recommended for SaaS sales professionals. There are over 300 sales KPIs called out in this book. Yes, you read that right. Cracking the Sales Management Code is Jason R. Jordan’s tour de force on measuring, evaluating, and inspiring the modern sales force. Moneyball for modern sales managers. There are so few books on sales management. Fortunately, you only need a few of them. This is one of those few. This is another sales book that’s less a book about selling skills and more a book about both product marketing and sales management. In a nutshell, the book outlines why your organization should create what the author calls a “Message Map”: A strategic company guideline that outlines the predictable business problems your solutions solve for, how your solutions map to those problems, and what messages your can “load” your sales force with for each type of predictable sales conversations they’ll encounter. I don’t know a single person but myself that’s read this book, and it’s a shame. Some entries on this list transcend sales itself and pull in other disciplines such as marketing and operations. Customer Message Management is one such book. An excellent read for sales and marketing leaders alike, CMM teaches business leaders how to work backwards from the vantage point of the customer, understand their roles, goals, and pain points, and make them the foundation for powerful positioning, messaging, and sales collateral. Another book that belongs on the shelves of CMOs and CSOs alike, Differentiate or Die takes stock of the all-important brand identity. Author Jack Trout is an expert storyteller, using examples from Wal-Mart, Dell, and Southwest to flesh out campaigns that brilliantly, effectively, lucratively differentiated products and thrust them into a higher position of power within the marketplace. A must-read. Admittedly, The Dip is not a true-blue sales book. But the lessons of persistence it teaches should be understood by anyone that aims to make a career in professional selling. Prolific and influential business writer and blogger Seth Godin goes counter-intuitive in The Dip. Turning an old saying on its head, Godin cogently fleshes out the fact that winners can quit and quitters can win – the important thing is knowing when to quit and what to quit. Here’s what I love about this sales book: It’s about the science of running a sales organization, not gut and intuition. Written by the former CRO of Hubspot (Mark Roberge), the book outlines four components for building a “Sales Acceleration Formula”: The Sales Hiring Formula, The Sales Training Formula, The Sales Management Formula, and the Demand Generation Formula. Must read for sales managers (and aspiring sales managers). As a quick side note, if you’re hiring, here are 35 great sales interview questions to ask your candidates. This another book every sales professional should read, but isn’t a sales book per se. Why? It’s about time management, self-management, and effectiveness: Common themes of building a successful sales career. At varying points of his legendary career, Peter F. Drucker advised the heads of General Motors, Sears, General Electric, and IBM on management strategies and principles. His quintessential work, The Effective Executive, is a brilliant treatise on the preeminence of action and results over ideas and imagination. Your yardstick as a salesperson is getting the right things done. Let Drucker show you how to mold your mind to do just that. Fun note: In one of the first chapters, Drucker recommends you track every minute of your time in a spreadsheet for a few weeks, just so you have a baseline understanding of where your time goes. I’ve actually done that several times in my career, and it’s been tremendously rewarding. This is another one that isn’t directly a sales book (are you seeing a trend here? There are many types of books that directly help you in your sales career, but aren’t exactly “sales books”). In The Fearless Mind, Craig Manning’s astonishing look at the ways you can train your mind to overcome insecurity and anxiety, unlock confidence, and channel your inner greatness. Scared selling is ineffective selling. Our next two entries are back-to-back slam dunks from Harvard Law School professor and negotiation expert, William Ury. Getting Past ‘No’ offers up 5 simple steps to gaining maximum leverage during the negotiation process. If you hear ‘no’ in your day-to-day (every one of you) or have some measure of control over the final price point in your deals (most of you), pick up Professor Ury’s book ASAP. Written 30 years after Getting Past No, Getting to Yes is the long-awaited and critically acclaimed sequel that – in the eyes of many – transcends the original. It’s also one of the most well-written, easy-to-grasp sales books in this list, as Ury and his co-authors write with vigor, authority, and a straightforward, no-nonsense step-by-step style that drills home the book’s vital insights for modern sales professionals. This is one of the best sales books of all time. You know you are reading a great sales book when Dale Carnegie, of all people, has named it one of his personal favorites. How I Raised Myself from Failure to Success in Selling is a gripping read from a fascinating author, Frank Bettger, who spent his thirties transforming himself from a failed insurance salesman into one of the most highly-paid salesmen in the world. If you are going through a rough patch in your sales career, by all means, pick up a copy of this book. Modern sales is becoming more and more reliant on implementing technology to accelerate the sales process. But there are so many tools and technologies out there for sales, it can quickly become overwhelming to sort the wheat from the chaff. Max Altschuler in Hacking Sales does a great job explaining why sales leaders must deploy technology (along with a data-driven approach to optimizing the sales process), and how to sort through and deploy these various technologies. Read this sales book right before you start to scale a well-understood process. Speaking of Dale Carnegie, you may have heard of a little book he once wrote, How to Win Friends and Influence People. Maybe you are one of the 15 million people who has already picked up a copy. If not, then it’s time to join the ranks and discover why they call it ‘the only book you need’ as a salesman. I have mixed feelings about this one. Some of the sales techniques are very outdated (particularly for complex B2B sales — Tom’s experience was in real estate). However, this sales book is still very well worth the read. He has dozens of sales techniques. Some outdated like I mentioned, but some are effective. And hey, if you pick up a single effective technique, then it was worth the read, right? How to Master the Art of Selling also has a ton of amazingly good thoughts about mindset, goal-setting, and other “blocking and tackling” elements of building a successful career in general. Back in the 1930s, the trailblazing Napoleon Hill forged one of the most important, lasting entries in sales literature. How to Sell Your Way Through Life is jam-packed with timeless wisdom and searing insights from the Great Depression, written by a man who pioneered the self-help genre and teaches you how to reshape the way you think to become a more effective influencer and, yes, salesperson. Almost every sales leader and marketing leader worth their salt that I’ve met has read Influence. Author Robert B. Cialdini takes a long, hard look at the science of sales through the lens of behavioral psychology in Influence. In sales, the number one competitor many of us face is the fear of change. Lucky for us, Cialdini dedicated his 35 years of rigorous research and 3 years of close study to find the underlying psychological forces that drive human beings to change their behavior – all of which are fleshed out in this book. In sales, some of us are bass fishermen and some of us are Captain Ahab. Mastering the Complex Sale is for the latter group. Whale hunters that need help navigating massive, complex deals with myriad stakeholders, millions of dollars on the line, and dynamic sales processes will find legions of insight from Jeff Thull’s brilliant treatise on the mega-deal, written by a guy who has helped Shell, 3M, Intel, HP, Tyco, Siemens, Boston Scientific, Abbott, and fast-track start-up companies understand and master the complex sale. Again, this one doesn’t fall directly into the “sales books” category. Stanford Psychologist Carol Dweck brilliantly captures the binary point of differentiation between people who succeed at the highest level and people who don’t in Mindset. If you are thinking with a static mindset – doubting yourself, disbelieving your ability to change and adapt – get that weak garbage out of here. Pick up a copy of this book. This is easily my favorite sales book. And it’s not even a sales book. Never Split the Difference is a book on negotiation, behavioral economics, and influence. Author Chris Voss ran international hostage negotiation for the FBI for around 15(?) years. And boy does he have some stories to tell. You’ll also learn some of the most valuable sales and negotiation principles you’ll ever find. The New Conceptual Selling is the definitive work from the definitive names in sales consulting, Miller Heiman. This book teaches you how to make the leap from generic product pitch to consultative, solution-driven conversation. Read this book. Implement its recommendations. You’ll be amazed at the results. Another must-have entry in the sales book canon, The New Solution Selling applies most directly to whale hunting but has value for anyone dealing with nuanced, prolonged sales cycles. Author Keith M. Eades aims wide and tackles a variety of subjects – from tools to techniques – with astonishing breadth and depth. Give it a look, Ahabs. Scott Leese is the master of high-velocity, transactional B2B selling. He’s spent his career in multiple VP and SVP Sales positions scaling high-velocity sales organizations from just him to hundreds of sales reps. Addicted to the Process summarizes what Scott has learned along the way. He talks at length about mindset, psychological, and maintaining motivational stamina enough to reach greatness in the transactional, short cycle sale. When I ask VPs of Sales which sales books they recommend, this one almost always comes up. The original Miller and Heiman classic, The New Strategic Selling made massive waves upon its original release in 1985 and remains an essential sales book for the C-Suite all the way down to the frontline sales reps to this day. This one is a little “weird” but I oddly loved it. Author Dan Kennedy has one of the best nicknames in the industry, “The Millionaire Maker.” His best book on sales, true to its name, pulls no punches and gets straight to the heart of the matter on re-positioning, the takeaway, and more. Do yourself a favor and pick up a copy of No BS Sales Success in the New Economy. A phenomenal, important work with broad applicability to life in general, The Paradox of Choice illustrates the power of removing choices to reduce anxiety and increase general well-being (the application to sales? Don’t make your customers think too hard :). In the hands of a capable sales professional, Barry Schwartz’s social science-based examination of the human behavior can be a powerful weapon for hitting quota. What does a S.T.R.O.N.G. sales pitch look like? It sets the stage. Tells a story. Reveals intrigue. Offers surprise. Nails the hook. And gets a decision. In Pitch Anything, Oren Klaff takes you through each of these steps with gripping narrative and compelling examples. Another must-read for both sales and marketing professionals. Marketing is sales. Sales is marketing. Positioning is everything. The first book to take stock of the Information Age and the new realities it brings to sales, Positioning is timely, authoritative, and essential to the modern sales professional seeking to be heard and understood in today’s noisy, crowded marketplace. Many sales books fail to address the all important topic of prospecting. This one, doesn’t. Imagine the History Channel rewired for salesman consumption. That’s Power Prospecting. Author Patrick Henry Hansen takes readers through famous historical episodes ranging from ancient Greece to 1800s Appalachia to provide key allegories on the nature of the sales profession and the art of persuasion. If you ask most technology sales leaders which sales books they’d recommend, this one usually comes up. A stone cold classic. Predictable Revenue launched a bona fide movement in B2B sales and put Aaron Ross and Marylou Tyler’s brilliant strategies in startup incubators and Fortune 500 boardrooms around the world. A must-read for senior sales leadership. Newsflash: human beings are given to foolish behavior, acting against self-interest, and getting in our own way. Predictably Irrational explains the science behind human folly and offers great insight into the inner-workings of our own minds and the minds of our prospects. Renowned business communication expert Carmine Gallo picks the perfect subject for a book on sales presentations in The Presentation Secrets of Steve Jobs, exploring the iconic Apple founder’s most memorable techniques in comprehensive, detailed analysis. Take notes and apply to your next presentation. Published in 1960, Psycho-Cybernetics is one of the all-time heavyweights in the world of self-improvement. The concepts of visualization and positive thinking were forged in this book, which has sold over 35 million copies – for good reason. Just read for yourself and change your life for the better. No book better teaches you how to harness the power of the question to close deals than Thomas A. Freese’s Question-Based Selling. Freese calls out one of the biggest misconceptions in sales – that it’s the prospects job to ask questions and the salesman’s job to answer them – and shows how flipping the script can help you, the sales professional, close more deals. You’d be hard-pressed to find a more influential voice in sales development than Trish Bertuzzi, Bridge Group Principal and author of The Sales Development Playbook. If your team uses (or should use) Sales Development reps to prospect and qualify new sales leads into opportunities, you should have already read this book. Author Dan Seidman begins The Secret Language of Influence with a revelation: in order to truly influence someone to take action, you must reach their subconscious. Deftly written, overflowing with value, The Secret Language of Influence is a fascinating read that offers myriad examples of scenarios where deploying humor, appealing to emotion, and emphasizing solution versus pain are the most effective means for influencing a buyer – and why. Jill Konrath has written many sales books. Her masterwork, Selling to Big Companies, contains some of Jill’s most creative, innovative, and brilliant strategies for breaking through to big-ticket buyers. This book goes the extra mile by tying these insights into the big-picture strategy – a timely, necessary read for anyone selling into the enterprise. The digital transformation of sales has changed the profession forever. Fortunately, revered sales consultant Josiane Feigon is here to show you the ropes on running a hybrid sales process that leverages both phone and digital channels to give you a selling edge. We highly recommend Smart Selling on the Phone and Online for anyone dual-wielding a phone and a computer to close deals – in other words, all of you. Read more than just sales books! Start here. Another book that far transcends the sales profession, So Good They Can’t Ignore You has value to anyone grappling with uncertainty or anxiety about their career choices. The thesis is skill acquisition is a more important element of career happiness and success than predisposed passion for your job. Cal Newport argues that fulfillment mainly comes from getting really good at what you do. In your case, that is selling. Few sales books have stood the test of many decades. This one has. A fantastic sales book that drives a stake through the heart of every bad sales practice. No more smoke and mirror tactics. No more high-pressure selling. Solution Selling is the antidote to the Shelley Levene-approach to selling, guaranteed to make you a more capable salesperson who operates with a higher level of integrity. This is one of the first sales books I read when I started my career in B2B selling. What went into the writing of SPIN Selling? 12 years. $1M in research. Neil Rackham’s magnum opus broke new ground when it debuted in 1984. How do the best sales organizations operate? Very similarly – as it turns out. Rackham cuts through the data to glean the consistent sales best practices used by Xerox, IBM, and CitiCorp, then shows you how to apply them to your team. The most cleverly-titled book on this list is a nod to the Darwinian reality of sales – it’s a ‘kill or be killed’ world out there. In Swim With the Sharks Without Being Eaten Alive, author Harvey Mackay writes with the zeal of a revival leader and the confident insight of a man who has lived the book’s title. We particularly love The Mackay 66, one of the best competitive intelligence systems you’ll find in business – Bill Belichick and the NSA would approve. How do you tell stories that influence positive outcomes in sales? You create, elevate, and capture value. Credit to The Three Value Conversations for breaking down these quintessential elements of success in simple and compelling fashion. We poured our heart and soul into The Ultimate Guide to Winning Sales Conversations, asking 74 leading sales minds to provide their go-to techniques that create effective sales conversations. They delivered in spades. Their answers are yours to read in our free eBook. The late Chet Holmes is one of my favorite sales authors and wrote one of my favorite sales books of all time: The Ultimate Sales Machine. The thrust of the book is how to focus one hour per week on a key area of your business – and over time, methodically create a well-oiled predictable revenue machine. Half of communication is nonverbal. Most sales books don’t address that. Which is where Joe Navarro and his epic book What Every Body is Saying enter the equation. The former FBI counterintelligence officer shows how to become a body language expert and reader of people, valuable insights for sellers looking to respond to non-verbal cues during key meetings. In What Great Salespeople Do, authors Ben Zoldan and Michael T. Bosworth make one of the most comprehensive, compelling cases for sales methodology ever put to wax. Multi-disciplinary supporting evidence from psychology, anthropology, sociology, and even neuroscience is used liberally to explain the preeminence of emotional appeal over logical appeal during the sales process. Some sales books teach you how to sell. And some just plain make you fall in love with the profession of selling. This is an old (and rare) book, and totally worth reading if you can find yourself a copy. Wally Armbruster is a classic 1960s “ad man” (without the neurotic behavior) but fancies himself to be more of a salesman than a marketer, deep down. Where Have All the Salesmen Gone?, more than anything, will rekindle your fire to become very good at selling than anything else. I personally use this book as a motivational tool for myself, rather than a textbook on how to sell. The second entry from Patrick Henry Hansen, Winning Sales Presentations is a history-loving sales professional’s dream come true. Hansen uses epic stories from history to flesh out the best practices that create compelling presentations. Choice examples: Winston Churchill’s savage declaration of war against the Third Reich, Lincoln’s Gettysburg Address, and Patrick Henry’s “Give Me Liberty or Give Me Death” speech. The last entry on our list is brought to you by the world’s best negotiator, Herb Cohen. You Can Negotiate Anything looks at the art of negotiation through a holistic lens, and shows you how to become a better negotiator in both your personal and professional dealings, whether you’re an accountant, a painter, or – yes, a salesperson. Which Sales Books Are Missing from This List? Okay, so I’m sure there are tons of sales books that are amazingly good, but didn’t make the list here. One person can only read so much! I’ve intentionally only included sales books that I’ve personally read. So, help me complete the list! Which sales books are missing?